US President Donald Trump signed a statement on Monday recognizing Israel’s sovereignty over the territories of the Golan Heights, which the international community considers a Syrian territory under Israeli occupation. 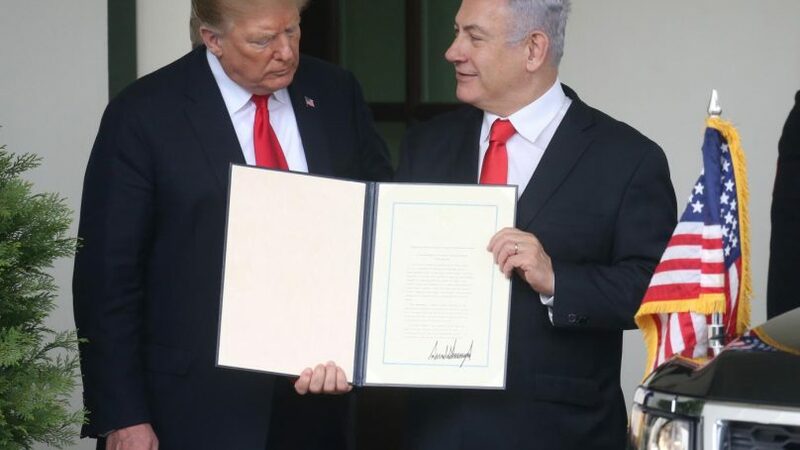 Trump signed the statement in the presence of Israeli Prime Minister Benjamin Netanyahu , who is visiting Washington. Netanyahu thanked the gesture of Bush and considered that its decision makes the link between the two countries is “stronger and greater than ever” , according to Israeli Radio Kan means. “His proclamation (Trump’s) comes at a time when the Golan Heights are more important than ever for our security,” Netanyahu said at a subsequent press conference. Last Friday the US president said in a message on his Twitter account that it was time for the US recognize the sovereignty of Israel over these territories, which snatched Syria in the Six Day War of 1967. “After 52 years, it is time for the US to fully recognize Israel’s sovereignty over the Golan Heights, which are of strategic importance and critical security for the State of Israel and regional stability,” he wrote. Syria did not take long to respond to Trump’s act. The government of that country considered that the president’s decision is “a violation of the sovereignty and unity of the Syrian territory , “ says the official SANA news agency. What are the Golan Heights? The region is located about 60 kilometers southwest of the capital of Syria, Damascus, and covers an area of ​​about 1,200 square kilometers. Israel snatched the Golan Heights from Syria in the Six Day War of 1967 and extended its law to the territory in 1981, a step equivalent to annexation. Image caption Israel has occupied the Golan Heights for years. It was the result of a conflict that took place between June 5 and 10, 1967, in which Israel was confronted on three fronts by the armies of Egypt, Syria and Jordan. As a result, it wrested Egypt from the Sinai Peninsula and the Gaza Strip; the Golan Heights to Syria; and East Jerusalem and the West Bank to Jordan. 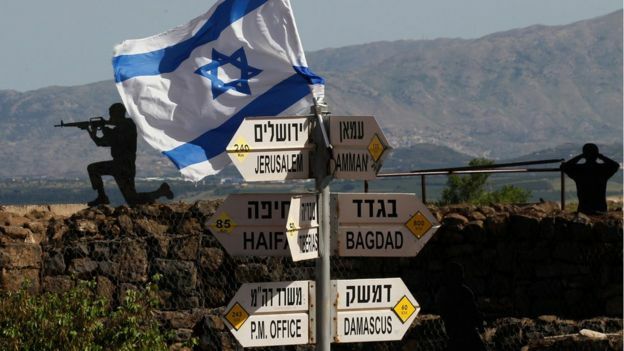 However, the international community has not recognized the Golan Heights as part of Israel and regards the area as a Syrian territory under Israeli occupation. Three years ago, when President Barack Obama was in power, the United States voted in favor of a Security Council statement expressing great concern that Netanyahu had declared that Israel would never give up on the Golan Heights. 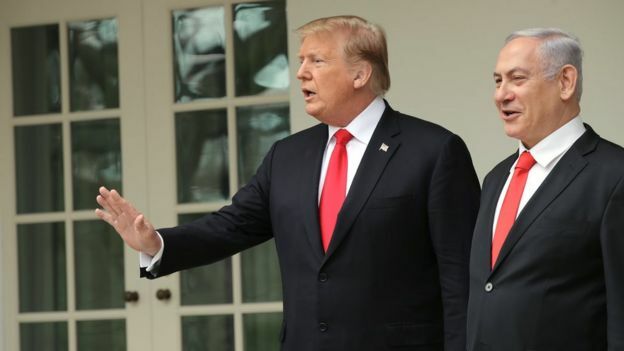 Image caption Netanyahu thanked Trump for his decision. Syria has always insisted that it will not accept a peace agreement with Israel unless it withdraws from the entire territory of the Golan Heights. The last peace talks with the intermediation of the United States failed in the year 2000; Turkey acted as mediator in an indirect dialogue in 2008. Currently, there are more than 30 Israeli settlements in the Golan Heights, where some 20,000 people reside. The settlements are considered illegal according to international law , although Israel denies this. Those who live in the Israeli settlements live next to another 20,000 Syrians, most of them Druze Arabs, who did not flee when the Golan Heights were annexed.